Muff will be making appearances, but won’t be completely functional for a while. Looks pretty good, though, for a first draft. I would have done an interactive dialogue with Thatch and Muff, but I have to figure out how to coordinate the images in a single set. It’s more complicated than you might think. Especially when I don’t really know what I’m doing. Cut me some slack, I’m a newbie. If you want me to have a chance to get more professional, follow me and click on “like.” Thanks! 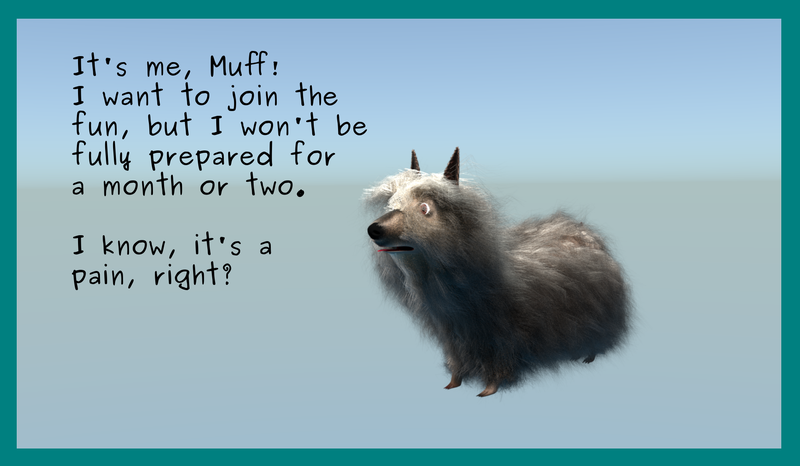 Muff: It’s me, Muff! I want to join the fun, but I won’t be fully prepared for a month or two. I know, it’s a pain, right?